Crime is an enduring and popular theme for developers of online slots and there have been some excellent examples from various companies in the past. 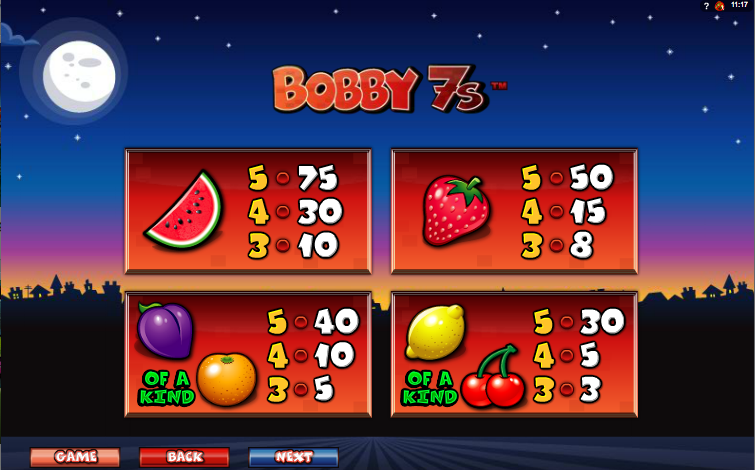 Bobby 7s is from Nextgen Gaming and it’s one of the most feature-packed games we’ve come across. It also continues the custom of adding a touch of humour to what is usually a pretty serious subject. 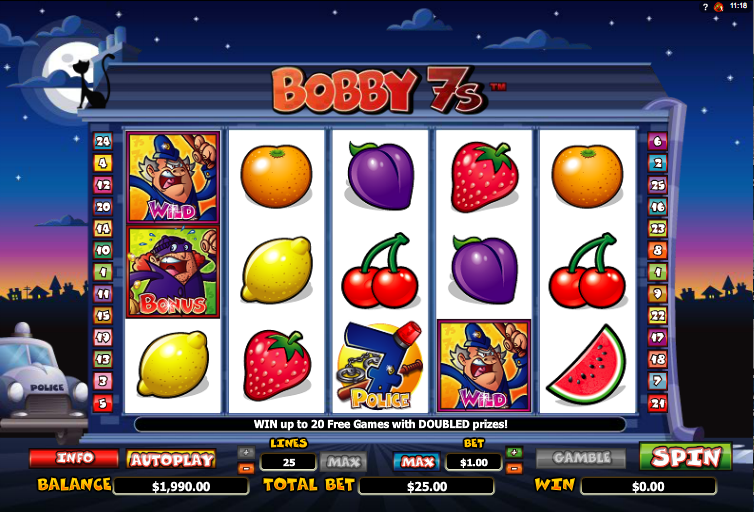 Bobby 7s is a five reel and twenty five payline game with a definite cartoonish quality. The reels are framed by a house and the whole environment is a night time one with clouds slowly drifting across the dark sky under a full moon. There are six basic symbols which are all fruit – cherries, lemons, oranges, plums, strawberries and melons. The truncheon-wielding copper is wild and because there are so many extra features there are lots of bonus symbols – these comprise the fleeing thief, the Police 7, the Crook 7 and the Judge 7. To trigger the spins you need to land three of the thief symbols anywhere on reels one, three and five. Now pick one of the three thieves codetermine the number of spins awarded. All wins will be doubled and you’ll be pleased to know that any of the other features can be triggered from here. More free spins can also be awarded by landing more thieves. Landing three of the Police 7 symbols on reels one, two and three will kick this mini-game off. You get to play a Hi/Lo game in which you have to estimate whether the next number will be higher or lower in a series of ten. Every correct guess moves you up the cash ladder but a wrong answer will end the game at that rung. This brief mini-game is triggered by landing three of the Judge 7 symbols anywhere on reels two, three and four. A judge;s gavel will appear on one of those symbols and hammer down up to five times. Your prize will be increased with each slam. Three of the Crook 7 symbols on reels three, four and five will trigger this feature. All you need to do is select one of those symbols and you will receive a cash award. Any win can be gambled by pressing the ‘Gamble’ button below the reels. You can try and double or quadruple you win by correctly guessing whether the next card drawn is the right colour or suit. You can only gamble up to five times in a row but it’s unlikely you’ll get that far. Use this feature sparingly and don’t try for more than one or two correct guesses – the odds are against you. This slot is great fun and it’s clearly a game for those who like lots of action and bonus features. There’s always lots going on and there’s a welcome touch of humour as well.